Spc. 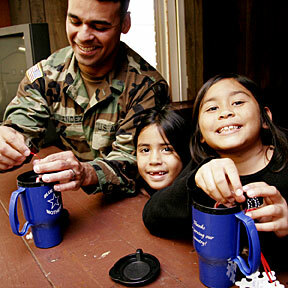 Luis Mendez, with daughters Maya and Kimberly, opened candy-filled mugs yesterday from the Oklahoma Chapter of Blue Star Mothers of America. The pickup truck's occupants are in serious condition after crash. Soaring real estate values bring calls for the city to lower rates. HPU's Swedish Student Association brings a seasonal taste of Scandinavia to the isles. Loyola Marymount leads by as many as 10, but Hawaii finds a way to advance in the tourney. The Ohana Pacific Bank is one of two new Hawaii financial institutions that plan to open this spring. A boost in revenues gives the governor and legislators room for tax cuts and increased spending.